“a portable, unsanitary, over-crowded, leaky building” children and adults gathered to study, play, sing and worship. Mrs. Klare began her youth group with five cent ham suppers to raise money for the permanent church building we know and love today. Victoria Congregational Church is in the midst of some changes to be more intentionally connected to the surrounding Briarwood Community of Jamaica. The Worship Service has been moved from 11:00 AM to 4:00 PM so that the members of Victoria Congregational Church might meet more with the attendees of the Free Briarwood Community Meal which is offered to anyone who is in need. Those attending the meal will have a more convenient opportunity to worship with Victoria at this new time. to be an even more Wel﻿﻿coming Community, affirming All of God's Children. 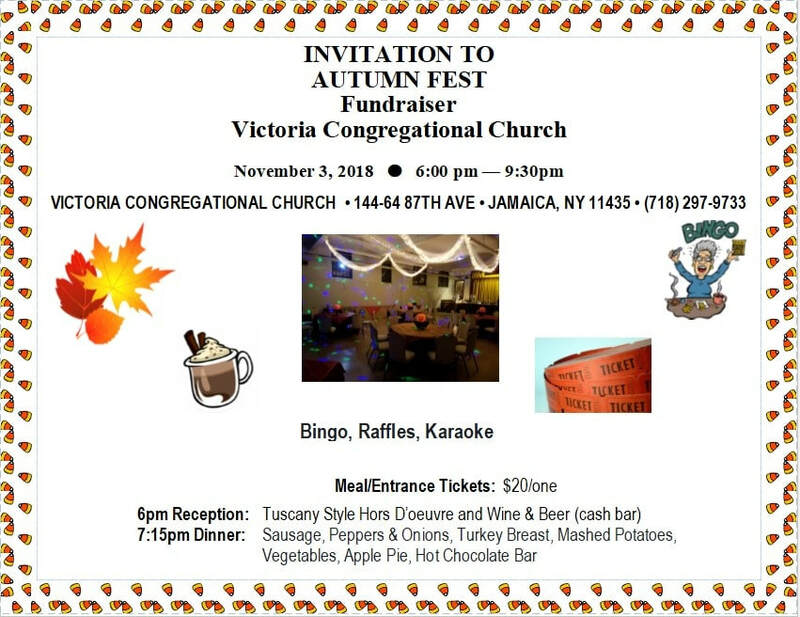 please contact the church office at (718) 297-9733 or vccny@hotmail.com for more information.